In an apparent reply to the Finance Minister’s scathing criticism of him, the Auditor General (AG) yesterday said he would always speak openly and strive to maintain the institution’s transparency. Highlighting that transparency and openness were two of the main features of good governance, AG Gamini Wijesinghe said that he was duty-bound to give information on public assets, especially following the enactment of the RTI Act. How can the Auditor General have secrets and form good governance. Transparency and openness are two of the main features of good governance. We are all handing assets that belong to the public so I cannot maintain secrecy on information regarding public assets,” Wijesinghe said while speaking at an event held to present the audited accounts of the Colombo Municipal Council. If anyone wants to write secret letters to me then they should first state that. As the Auditor General I will not write any secret letters to anyone. I cannot do so. I will uphold the transparency and sensitivity of the Government service,” he quipped. As a mechanism to fall in line with the new regulations presented by RTI and to ensure transparency, Wijesinghe plans to upload all his reports to the official website of the Auditor General’s Department. The RTI is in force; one may take me to courts if I don’t publish the reports. Before this happens, I have developed my website. After sending the report to the relevant officials I will upload all of them to the website,” he said. During the parliamentary debate on the Committee on Public Enterprises report on the controversial bond issue, the Auditor General came under fire for allegedly releasing a report, which Finance Minister Ravi Karunanayake requested, to JVP MP Bimal Ratnayake before it was given to the Minister. However, Ratnayake, who quoted the AG’s report, later clarified that it was sent to the COPE office not released to him directly. Wijesinghe also spoke of the wider powers vested in the office of the AG by the 19th Amendment to the Constitution and the proposed National Audit Bill highlighting that there would be no room for corrupt practices once the new Act was in force. He highlighted that both the Act and the 19th Amendment had widened the scope of the AG to audit not only financial accounts but also other areas such as the quality of service provided and to conduct environment audits. One of the main features of the new Act is the authority it bestows on the office of the AG to issue surcharge certificates to any government servant working at any state institution who is found guilty of corruption or malpractice, he said. With the current Act, the AG only has power to do so in cases relating to local authorities and universities. However, even this is reversible by the subject minister. Under the proposed Act ministers will no longer have the power to reverse surcharge certificates. The Act will provide for the establishment of an Audit Commission which will deliberate on surcharge certificates issued, Wijesinghe explained, adding that individuals also have provisions to seek legal action if they were dissatisfied with the audit process. The surcharge certificates are not issued overnight. They are issued after much deliberation following audit quarries and discussions. Even then the only thing possible through the surcharge certificate is to recover the losses suffered by the state from the wrongdoer,” Wijesinghe said, adding that the process had been demonised unnecessarily. He also highlighted that wrongdoings or shortcomings should not be forgiven or overlooked, asserting that doing so would perpetuate the declining quality of the government service. The Auditor General also urged Government servants to stand strong to deliver services with discipline and integrity. Emphasising that Government servants had lost their drive and respect by trying to curry favour with their superiors, Wijesinghe said that state officers should not try to become pets” of anyone. Do your duty diligently and pay attention to the process. Always add notes on why a certain decision was taken, if there is a record of that then the Government officer is safe,” he said, dishing out advice on how to avoid manipulation by higher officials. We should thank President Sirisena for appointing and retaining Gamini as Auditor General – the best we had for the past 40 years. This is especially so in the light of what happened to Shirani Bandaranayake who was impeached by MPs for giving the correct verdict. 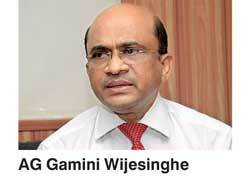 All those who love the nation must protect Gamini – a rare gem, true to his name, in a corrupt society. Another good of this government is the Right of Information Act. A very bold decision that politicians will find a thorn in their sides. I hope that it will be implemented as intended. It came into effect yesterday. People must demand a list of loans since 1977 or at least 2000 and the projects they were used. Politicians from both sides use deception to deflect the issue while almost all state revenue (since 2011) goes to repay interest and repayment of loans.